Home » Current Events » Share your New Year’s Resolution and Win! Share your New Year’s Resolution and Win! JewishMOM, what’s YOUR New Years Resolution for the (IY”H!) glorious new year 5772? What a cool video ! This year I’m gonna try to pay more attention to things I say, not to harm anyone in any way. My new year’s resolution is to work on shalom bayis. Usually, I have a list of about 10 middot that I want to work on each year. This year, I’ve decided to narrow it down to just one: patience. I’m working on patience with myself, my baby, my husband, my colleagues, my community, my extended family, and with HaShem. My goal is to live in every present moment and not get distracted by the big picture. This year I would like to work on hachnasas orchim on Shabbos. Having guests to eat and sleep at our house, especially people who don’t have a place to go. to continue working on being more patient and to fight anger! also, not to read Jewish Mom when I’m at work which is a strong temptation 😉 Good luck everyone! I resolve to try and strengthen my connection to Hashem by trying harder to keep the mitzva of thanking Him for all the (seemingly) bad as well as for all the good in my life. CJW: As a follow up to this competition, maybe next year you should check up on us to see how we did! nothing like a yearly review to keep us on our toes …. sound familiar? I will try my best not to assume thoughts, and reasons behind others actions- Be more forgiving- and if I wind up in an argument with my husband- Not in front of the children!! My resolution is to not make my husband feel guilty about having to go away for work for 6 weeks. He goes away every year for 6 weeks for this mashgiach work (the grape harvest). He does come home for Shabbos and Yom Tov. In the past years, I have kvetched and cried on the phone every night to him. I made him feel guilty by saying that everyone else has a husband that helps and mine is far, far away. I complain that the kids are making me insane and I need him home NOW and I just make him feel bad, bad, bad. This year I am going to support him and thank him for working hard to bring our parnassah in. my new year’s resolution is to try to be more relaxed this year, and to put less pressure on myself. To try to speak to Hashem every day for up to an hour, and to try to nullify my yetzer hara of self-doubt — with Hashem’s help. Oh, and shalom bayit is a biggie too. 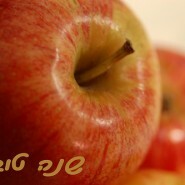 May we all have a Gmar Chatima Tova! to trust G-d, and be blissful more. I picked something very small and simple: every time I use my computer it prompts me for a password. Every month it asks me to change my password. So I decided to pick passwords that will remind me to do the things I always say I want to do. E.g. first month’s might be “gratitude” then right there and then I can think of ten things I am grateful for. The next month I might pick “compliment” and I can pay a nice compliment to whoever is around, or to myself, or write a little note for someone to read later. wow, this is totally brilliant…thanks for sharing this rachel! My new year’s resolution is to accept the fact that I’m a Mom. I’m going to stop trying to run away from my obligations & embrace my very important job of helping my kids grow to be happy, healthy & kind people. I will be happy & accept even those moments where 1 kid is throwing up while the other is running awy from home while the 3rd decides to perfect his circus act of jumping out of his crib head first- and all this when my hubby is gone. I will try to remember that got gave me these three precious gifts or a reason- & I should really enjoy the moment. I will bl”n be more patient with my 13 year old. I will try not to be critical when he does something wrong but rather to be patient with him like I should. My New Year’s resolution is totally inspired from Rabbi Nivin’s Chabura (thank you SO much for recommending it). It really has 13 parts but the main theme is to have TOTAL trust in Hashem that everything He does is good for me, trust in my husband, trust my friends and trust the community! A Rav suggested that a good way to approach Elul and the yamim noraim would be for me to choose one area between man and G-d that needs work, and another are between man and man. For the first, I chose to daven (pray) more slowly, with more concentration on the meaning of the words, rather than mindlessly rushing through them; for the second, I am, with G-d’s help, working on not causing others to have to wait for me; i am trying to plan things realistically, so that I am on time and dont inconvenience friends/students/ car service drivers.